The following is not intended to substitute in any way for the Show Rules. It is merely a guide for novice clubs or persons planning their first show. The Show Rules become, of necessity, a source of constant reference. These are the steps taken in their order to stage a show. The first step after you have decided you are going to have a show is the date. Your club votes on the date and you submit your request to the Association Secretary. She, in turn, will advise quite promptly if your choice is acceptable. Do not choose a date too close to that of another club in your area. It is wise to reserve the date well in advance. Some clubs do this many months ahead of time. Your annual dues entitle you to one license each year without charge. When you have selected your judge, submit to her your invitation to judge your show, asking for her fee, expenses, etc. If same is agreeable to all, the license forms, in triplicate, supplied by the Association Secretary are filled out with the first, second, and third choice judges, and returned to the Association Secretary. Show licenses must be approved at least 60 days prior to the opening day of the show. Note that at this time, shows had only ONE Allbreed judge contracted! Should you wish to hold Specialties in conjunction with your All-Breed Show, ie Long-Hair, Short-Hair, or others; select the Specialty Club you wish to sponsor same and advise them, naming your choice of judges. Some Specialty Clubs reserve the right to select the judge. They will let you know if your choice is satisfactory, and, if so, fill out the license forms in triplicate with the three choices of judges and send it, along with a check for $10.00 made payable to CFA, to the Specialty Club Secretary. The Specialty Club secretary will sign it and send it on to the Association Secretary for approval. Show licenses must be approved at least 60 days prior to the opening day of the show. "Longhair" and "Shorthair" rings of today, but also some other unique classes. "Tabby and Tortie", "Siamese", "Silver", "Solid", "Domestic Shorthair". one for Siamese, one for Solid Colors. All this having been taken care of, it is time to select your show officials. The club will elect the Show Manager. In some cases the Show Manager will reserve the right to name her own committees. It will be necessary to have, in addition to the Show Manager, an Assistant Manager, Show Secretary, Entry Clerk, Trophy and Ribbon Chairman, Door Committee, Hostess, Stewards, Catalog Chairman and Judge’s Clerks. The first five should be named as soon as possible and the others may wait until shortly before the show. It may be helpful to combine the offices of Entry Clerk and Show Secretary. It is not difficult for the person who has filed the entries to prepare the catalog since he or she has been over them once. The duties of the manager are many. She will have the responsibility of benching the show, arranging for microphones, lighting equipment, etc. Frequently the manager and show secretary will combine their efforts and thus take the load off of one person. The floor plan, when drawn, may have to be submitted to the fire marshall for approval. Be sure to check on this at least two weeks before the show, since laws may differ in various locales. You may also need a city license. If so, this should be obtained and placed in the show room. The show secretary shall compile an invitation list. This should be taken from several recent show catalogs and will be used in sending the invitations, entry blanks, announcements, etc. Some clubs have discontinued the invitation. 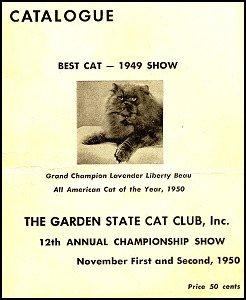 An ad in “Cats Magazine” or “All Pets” well in advance of your show will usually bring results. Actually the cost will, in all probability, not exceed that of printing invitations and mailing several hundred of the same. The show secretary compiles the catalog from the entry blanks. The catalog is typed in triplicate. The original copy goes to the printer, the show secretary retains one, and the manager the other. If there is an entry clerk it is advisable to have four copies as she must have one from which to compile her cage cards and envelopes for the exhibitor. When the catalog is completed, the entries are numbered. Remember to repeat the same number for Novices entered in both the Novice and Open classes. The printer will submit galley proofs and it is advisable to have someone to help with the proof reading. When ready you will then dummy your catalog. Your printer will show you how to do this. (This is easily done with a catalog from a previous show by pasting the galley proofs as you wish the catalog to appear.) The printer will supply you with three sets of proofs; one you will proof read and mark, the second for the dummy, and the other for the printer. The catalog had to be hand-typed - in triplicate!! The show secretary will solicit advertising from various manufacturers, pet suppliers, etc. It is advisable to solicit your advertising as soon as you have your dates. The beginning of the fiscal year is an appropriate time as the budgets have been set and limited, so first come, first served. The show secretary should mark the judge’s books from her copy of the catalog. Be sure to leave ample space for the judge to make notes. The show secretary will order Show Rules and judge’s books from the Association Secretary. About 300 copies of the Show Rules, one judge’s book for the All-Breed and one for each Specialty Show are necessary. It is wise to order these early and avoid the last minute rush. The show secretary also had to create the judge's books... by hand. The show secretary should make hotel reservations for the judges and advise them of same, and also send to said judges a copy of the Premium List and entry blank when these are printed. Copies of the Premium List and entry blank must also be filed with the Association Secretary. No standard entry form yet - each club could create their own, and had to file a copy of it with CFA. The show secretary must refer to the Show Rules and have printed on the Premium List any necessary item or items from them. After the show, the show secretary must mark and send to the Recorder, within five days, a fully marked catalog for the All Breed and each Specialty. Another marked catalog and Premium List must be sent to the Secretary of the Association. The All-American Scoring Sheets (for the All Breed and each Specialty), signed by the judges, a marked catalog and an unmarked catalog should be sent to the All-American Scorer within 10 days after the show. Usually the show secretary is the All Breed judge’s clerk. Another clerk must be selected for each Specialty judge. This can be an exacting job as many judges depend on their clerks to a great extent. It is helpful to keep a chart on the wins and it then takes but a moment to refer to same, and to know approximately which cats are to be called back. a very busy position to take on for a show back in 1959! After the show, the show secretary shall send each advertiser a statement for same and proof of copy. The entry clerk shall send entry blanks to persons whose names appear on the list supplied by the show secretary.Entry blanks are accompanied by Show Rules and Premium List. When the entries are returned, she shall catalog same and make a record of all monies received. A ledger chart is very helpful in keeping this record. List the exhibitor’s name, number of cats entered, classes, Specialty amount received, and whether paid in full or the amount due. The latter will appear on the exhibitor’s envelope and be taken care of at the door. The entry clerk will acknowledge receipt of entries. Do not accept phoned entries unless confirmed within 24 hours in writing, accompanied by the entry fee. This should appear on the entry blank or invitation in bold type. The entry clerk should also compile the envelopes to be handed to the exhibitor upon arrival. These will contain cage numbers, cat numbers, and exhibitor’s ribbon. The entry clerk must have all of the entry blanks with her during the show. Should an exhibitor claim a mistake has been made, it is then easy to refer to them and see where the error was made. Mistakes will happen – none of us is perfect. The trophy chairman will solicit trophies, etc. She shall compile the Premium List and submit it to the show secretary. It must be printed and accompany the entry blanks. It is well to remember that, once printed, the only changes that can be made are where the Club appears as the donor. An individual’s name may be substituted for that of the Club. The trophy and ribbon chairman will also order all ribbons for the show. 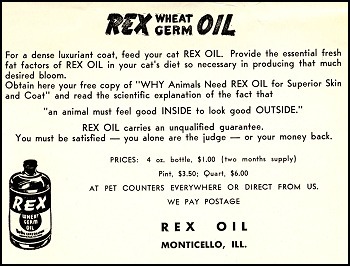 The requirements for this can be counted from the catalog. There are some that can be ordered in advance, such as Best in Show and Opposite, Best Champion and Opposite, etc. It is wise to obtain several bids as the prices will vary. She will also catalog the trophies and check the ribbons before the show, to be certain there are no errors. If at all possible, it is best to assign someone for this office. A record should be kept of all catalogs sold. Previous to the opening day for the show, the show secretary takes the catalogs she will need for the judges, advertisers, etc. It will be necessary to have two people at the door and they will be responsible for the sale of the tickets. Each judge must have a clerk, two if at all possible. It shall be her duty to mark the wins in the catalogs, and to check the judge’s slips for accuracy. She shall see that the slips are posted immediately after checking. It is best to have a bulletin board nearby for this. As each class is finished, she shall have the cats returned to their cages, remove cage numbers, and see that the cages are sterilized. She shall then post the numbers for the next class and call up the cats.